Description of "The Last Nomad (eBook)"
Every moment of Rahul Gite’s childhood has been etched with strange stories: untold stories from the dark and dreary lanes of thriving Shantinagar slum in Bombay. Written by nameless faces out of the thrust for survival, these are stories of love, hate, greed and belief. But everyone despises them; they bring us face to face with life—off guard and will-less. Then there is Ryan Davis, enjoying the ancient myths and legends from his parents, sitting in the drawing room of a well furnished apartment in Sagamihara, Japan—the land of hope. Life in Sagamihara has been nothing short of a fairy tale: streets bathing in the beautiful pink cherry blossoms, autumn leaves floating at the mystical Lake Sagami and gigantic kites magnificently soaring in the skies during the Sagami Giant Kites Festival. Every new day is a story soaked in fantasy, leaving Ryan longing for more. One day by happenstance, Rahul and Ryan meet each other at the crossroads of life. Will they have to let go the stories they have cherished? Born in Bombay and living in Mumbai, discovering his grandfather’s heaps of published and unpublished works one day—which he believes is an unwritten legacy left for him—naturally urged him to tell stories in his own voice. Through his personal blog InsightStories.in, he realized his work was being liked beyond family and friends. His passion for visual arts, particularly photography, drives him to explore storytelling in its varied forms. Being an amateur cyclist, he dreams of completing a 200 km cycle expedition along the coast of Maharashtra. Who knows how many untold stories the seas have in their bosom? 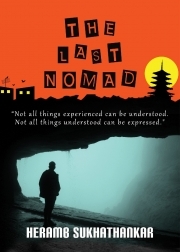 Reviews of "The Last Nomad (eBook)"